Some very large events known as fests (short for festival) have hundreds or thousands of participants who are usually split into competing character factions camped separately around a large venue. 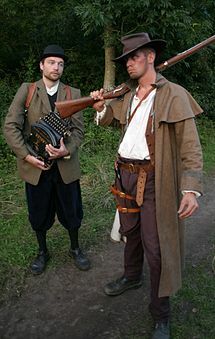 There are only a few fests in the world, all based in Europe and Canada; however, their size means that they have a significant influence on local LARP culture and design. At the other end of the size scale, some small events known as linear or line-course LARPs feature a small group of PCs facing a series of challenges from NPCs and are often more tightly planned and controlled by GMs than other styles of LARP. ^ Morton, Brian (2007). "Larps and their Cousins through the Ages" (PDF). In Donnis, Gade & Thorup (ed.). Lifelike. Knudepunkt 2007. Archived from the original (PDF) on 2009-02-05. Retrieved 2008-05-21. ^ Hyltoft, Malik (2008). "The Role-Players' School: Østerskov Efterskole". In Markus Montola, Jaakko Stenros (ed.). Playground Worlds. Ropecon ry. ISBN 978-952-92-3579-7. ^ Markus, Montola (2007-09-24). "Tangible Pleasures of Pervasive Role-Playing" (PDF). In Baba, Akira (ed.). Proceedings of DiGRA 2007 Situated Play conference. The University of Tokyo. pp. 178–185. Retrieved 2008-06-04. Alternate reality gaming is the most widely established subgenre of pervasive gaming, but others are evolving as well. ^ Kann, Taisia; Rozhkov, Viacheslav (2010). "Larp instead of communism: history and evolution of live-action role-playing in Russia". In A. Castellani (ed.). Larp graffiti: preistoria e presente dei giochi di ruolo dal vivo. Larp Symposium 2010. pp. 171–182. Retrieved 2013-10-11. ^ Larsson, Elge (2005). "Postmodernity and participation" (PDF). In Haggren, Kristoffer (ed.). Interacting Arts - International Issue 2005. Interacting Arts. Retrieved 2008-04-24. ^ Werkman, Rachel (2001). "Vampire: The Masquerade - a countercultural performance". In Lancaster, Kurt; Mikotowicz, Thomas J (eds.). Performing the force. McFarland. ISBN 978-0-7864-0895-5. ^ Baker, Andrew; Curasi, Carolyn (2008). Baker, Andrew (ed.). "Consequences of Co-Creation in Fantasy-Based Consumption Communities: Netnographic Analysis of a Live Action Role Playing Organization" (PDF). Advances in Consumer Research. 35. Association for Consumer Research. ^ a b c Leppälahti, Merja (2004). "About the Community of Role-Players" (PDF). In Markus Montola, Jaakko Stenros (ed.). Beyond Role and Play. Ropecon ry. ISBN 978-952-91-6843-9. ^ Montola, Marcus (2007). "Urban Role-Play: The Next Generation of Role-Playing in Urban Space". In von Borries, Friedrich; Walz, Steffen P; Böttger, Matthias (eds.). Space Time Play. Computer Games, Architecture and Urbanism: the Next Level. Birkhäuser Basel. ISBN 978-3-7643-8415-9. That Lord of the Rings-induced stereotypical image of LARP started to crumble in the 90s as LARP based on anything from science fiction to Jane Austen began to emerge, taking gameplay from forests and castles into industrial halls, idyllic villas and city streets.